As you may know, I'm in the process of making picture tutorials out of all my YouTube ones! 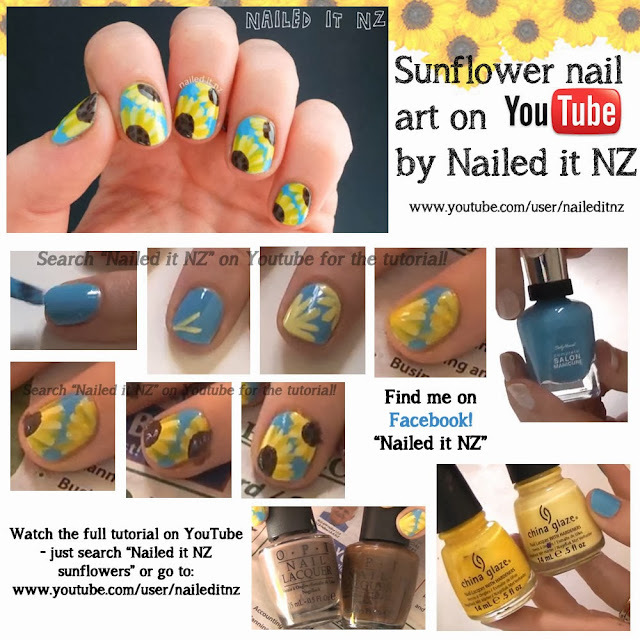 Here's my latest one - sunflower nails. Floral designs are some of my favourites, and sunflowers are my favourite flowers so it's only natural that this is one of my favourite manicures! Hope you like the tutorial - and I've embeded the YouTube version further down. Here's the YouTube version of it! Hope you like this! As with all my heavily-watermarked YouTube picture tutorials, feel free to share the tutorial picture wherever you want. Credit is nice but not necessary for these tutorials, as I pretty strongly point the viewer to my YouTube. Basically, I give permission for anyone to use them! The other ones you can share without credit are here, here and here. Please don't alter them though. If you're curious about image use in the nail world, check out my post about it here. Also, I have heaps more tutorials here. Have a great day and I hope you like my sunflower nails! If you try them out post them to my facebook wall, here :).